The panes and configuration options available for your AMI private offer depend on the contract that you negotiate. 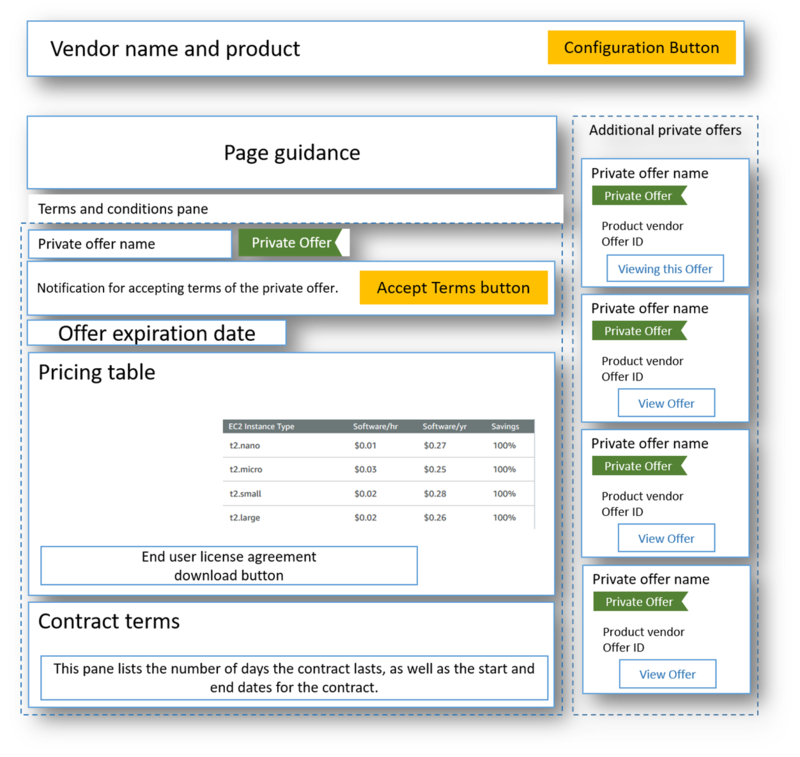 The following image shows the private offer page layout for AMI private offers and a brief description of each of the areas that you might negotiate with the product vendor. This is the name of the vendor and the product that the private offer is for. On the right is the configuration button for the product. The Configuration button is dimmed until you accept the terms of the private offer. This area has guidance for completing the tasks on this page and accepting the private offer. In the upper left is the name of the private offer and a flag indicating that this is a private offer. Below that is a notification for accepting the terms of the private offer and the button that you use to accept the private offer. Below that is the offer expiration date, as well as the instance pricing that you negotiated. Next is the end user license agreement (EULA). You can download it or view it on your screen. This pane show the number of days that the contract lasts and the start and end date of the contract. On the right are thumbnails of any other private offers that you have from this vendor for this product. The Configuration button is dimmed until you review the contents of the page and choose Accept Terms. After you have reviewed and agreed with all of the details for your private offer, choose Accept Terms. Choose Continue to Configuration to accept the private offer and continue to the configuration process for your AMI. If you're negotiating a Bring Your Own License model (BYOL) contract, you need to complete some manual steps. You must work with the ISV or your channel partner to sign a custom transaction form (CTF) that describes the pricing, terms, and payment schedule. The form is routed to AWS Marketplace for processing. The form gives us permission to subscribe to the AMI BYOL product on your behalf. After the subscription is complete, we send you an email notification. You can then view the subscription on the AWS Marketplace console at https://console.aws.amazon.com/marketplace. Verify that you're viewing the correct private offer. The vendor can create multiple private offers to you for their product. Any additional private offers appear in the additional private offers pane. Validate that the offer that you want to accept appears as Viewing This Offer. Verify that the offer expiration date and the pricing information are what you negotiated for the private offer. If they aren't, verify that you're viewing the correct private offer. Download the EULA and verify that it's what you negotiated for the private offer. In the contract terms pane, verify that the terms for the private offer are what you negotiated. After you have verified the details for the private offer, in the terms and conditions pane, choose Accept Terms. When you do so, you don't incur any charges. Charges for AMI usage are consumption-based, so you're billed as you use the AMI. To accept the private offer, choose Continue to Subscribe. A message appears, stating that your request is being processed. You must accept the private offer on the AWS Marketplace website. You can't accept it on the Amazon EC2 console. When you're ready to configure the AMI, choose Continue to Configuration. You must complete the subscription process for each use of the product.